Well only a short walk this week of 7.7. mile, we had to cut short the walk due to illness in the family. 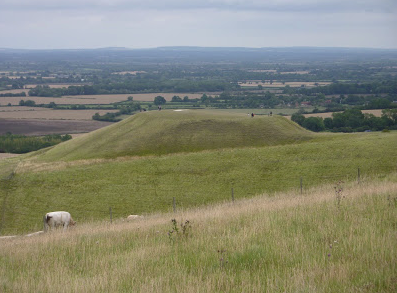 The site of this walk was White horse hill uffington Oxfordshire. The horse that is carved into the side of the hill is shown to date back 3000 years to Bronze age. The image above is looking at Dragon hill that stands at 139m and is rumoured to be where Saint George killed the dragon, further more, the dragons blood spilled causing a bald patch on top. There is some reading that states that the white horse is a representation of the stead that Saint George rode, or even the dragon. The next port of call was a visit to waylands Smithy long barrow. This stands at 185ft long and is one of the best in the country to look at. Excavations on the barrow have shown it to be built in two parts. The dates range between 3400Bc to 3700Bc. The tombs did contain the remains of 14 people, I have put Wickapedia links for you to read a bit more on it if you require. The next port of call was to the village of Ashbury where we had a quick pint in a very old Ale house called the Rose & Crown a good selection of beer in this old inn and this time I sampled a pint of Arkells 2B . We then headed off to Compton Beauchamp, which is a small Hamlet and from there we had to cut the walk short and head back to the car. I only took a few photos so please have a look at the Album below. We will be going back there when time allows.